Jaguar has just teased the chassis of its upcoming compact luxury sedan, the 2015 XE. The upcoming 3-Series rival will break cover on September 8 in London. The global roll out will begin in early 2015 starting from Europe and it will touch down on North American shores in 2016. The Indian launch is expected to be somewhere between the two time lines. The car’s chassis makes extensive use of aluminium to keep the weight down. Underpinning the entry level luxury sedan will be an advanced suspension design which is expected to make this a pure driver’s car, with an emphasis on sharp handling and a responsive steering. 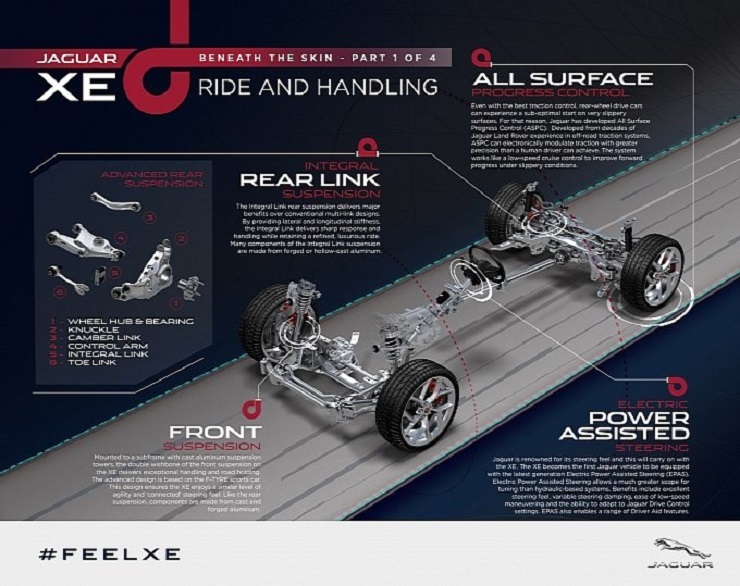 As per the new details that have emerged, the XE sedan will come with a double wishbone suspension set up at the front, a set up similar to the one found in the F-Type. The rear gets an integral link suspension. The fact that the XE luxury sedan shares some of its underpinnings with the F-Type makes it a car that focuses on being driven by the owner rather than a chauffeur. The Jaguar XE will also be the first car to be launched with Electric Power Assisted Steering (EPAS) in its latest form. Jaguar claims that the new electric power steering is quite a responsive unit with ease of low-speed maneuvering. The steering will come with the ability to adapt to Jaguar Drive Control settings. In order to combat sub-optimal traction on slippery surfaces, Jaguar has equipped the XE with All Surface Progress Control (ASPC). The car will be rear wheel driven. Under the hood will be the new Ingenium series of engines. The cylinders of the engine are built from 500 cc aluminium blocks and this will give Jaguar the flexibility of building new engines by adding or decreasing cylinders. The Jaguar XE will get a 2.0 liter turbo petrol and turbo diesel engines. There will also be a top of the line performance-centric variant with a 3.0 litre V6 petrol motor that will probably be built by the SVR division. Last time around, Jaguar failed miserably with the E-Type, that rivaled the likes of the BMW 3-Series, the Audi A4 and the Mercedes Benz C-Class. The XE, on the other hand, is probably one of the most awaited cars this year and we hope it lives up to the hype Jaguar has been building around it. When it lands in India, expect the Jaguar XE to be assembled through the CKD kit route. Pricing could start near the 30 lakh rupees mark.